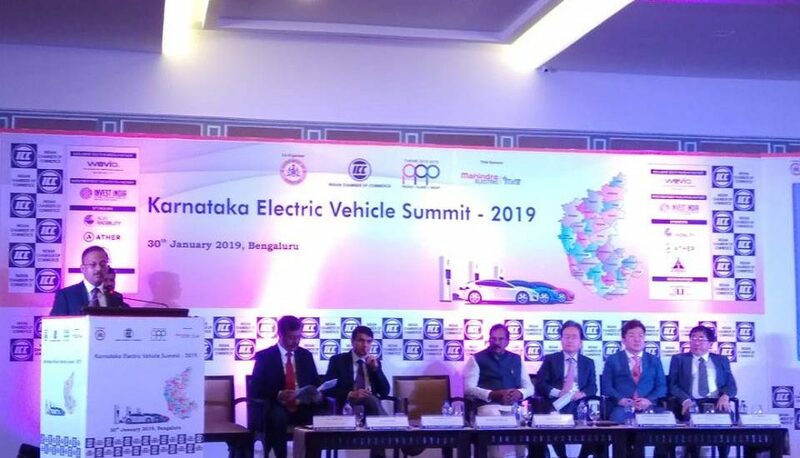 Bangalore, Jan 2019: Government of Karnataka – Department of Industries and Indian Chamber of Commerce (ICC) jointly organized an Electric Vehicle Summit – 2019 EV capital of India on Wednesday at Taj West End Hotel, Bengaluru, which is inaugurated by Shri. K.J. George|Hon’ble Minister of Large & Medium Scale Industries of Karnataka. While Addressing the gathering Mr K.J George, said that; To maintain the lead share of Karnataka as a preferred destination for attracting investments in manufacture of electric vehicles segment and attract Investments of Rs. 31,000 crore. To create employment opportunities to 55,000 people, to provide opportunities for R&D in electric mobility. His Excellency Shri Shin Bong- Kil |Ambassador of South Korea to India, said that they would like to help India in pollution free cities and mention about Korean companies Hyundai and various other companies planning to launch 300 km charging range by the end of 2019 in India. So they would like to help india provide similar climate for investment and infrastructure in India. Dr. Rajeev Singh, Director General -Indian Chamber of Commerce (ICC) said, Objective of the summit is to maintain the lead share of Karnataka as a preferred destination for attracting investments in manufacture of Electric Vehicles. To attract investments and create employment opportunities both from supply and demand side. Bring a delegation of electric vehicle manufactures, charging station manufacturers from the international provinces likes of South Korea, Japan, Taiwan which has rich electric vehicle manufacturing ecosystem. Along with Karnataka Electrical Vehicle Summit, exhibition of Electrical Vehicles, latest EV & Charging Technology, Services, Start-ups is also organised by IBC Expo team for companies interested in launching their electrical vehicles, related products and services in the Indian market”he added. As part of the summit, IBC Expo team has organized India First Global EV Exhibition “EV 360” where Mahindra Electric, Sun Mobility, Ather Energy, E Trio, NRD Eco Motors, Jitendra Electrical Vehicle, Ampere displayed Electric. The event concluded on the note of Indian chamber of commerce signing an MOU with South Korean association led by WEVIO in the field of electric vehicle mobility to promote Indo – Korean cooperation.